The Volleyball Club has not won any european title...yet. The greatest moment in the club's history is the final of the European Cup Winners' Cup in the season 1979-1980. Unforunately we lost... Three more times PAO VC reched the semi-finals, in 1989, 2004 and 2006. PAO VC was finalist in the European Cup Winners' Cup, but was defeated by Panini (Italy) by 2-3 sets. Panathinaikos reached the third position of the European Cup Winners' Cup and played in the final four against Lefski Spartak (0-3), Maxicono (0-3) and Bologna (3-2). We reached the fifth place in the European Champions' Cup having played against: Anhovo Salonit (3-2), Donausgraf (3-0), Nopico (1-3), Voivodina (3-1), Kazim Plomiem (3-0), Montena (0-3), Halbank (3-0). Panathinaikos VC reached the final4 of the CEV Cup. The club won the third place in the final4 of the Top Teams Cup in Mallorca. They defeated in the semi-final by 1-3 by Piasenca VC, but beat Vojvodina VC by 3-1. The VC reached the final of CEV Cup in Athens against the Russian club VC Lokomotiv Belogorie. The Greens were defeated by the Russians -1-3. 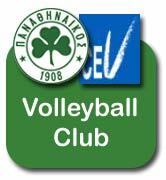 In the semi-final Panathinaikos had won Cuneo VBC 3-2.